Building performance simulation promises to reduce the future impact of buildings on the environment by helping architects predict the energy demand associated with different design options. We present a new method for simulating occupant behavior in buildings, a key phase in the prediction of energy use. Our method first inputs the recorded activities of actual building occupants, then randomly generates fictional schedules with similar behavioral patterns. The main contribution of this work is a mathematical technique in which an arbitrary set of factors can be used to select plausible activity types, durations, and numbers of participants during a simulation. 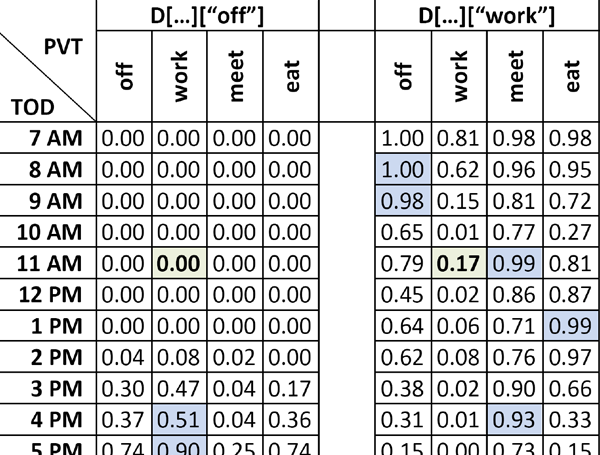 A prototype model was implemented to test the method, and results obtained to date suggest that the generated occupant schedules are believable when compared both qualitatively and quantitatively to real occupant schedules.